Alarm clock, calculator, phone, computer, CD player, camcorder, tape recorder. Let’s go back in time to 1991. It doesn’t seem that long ago to many of us, but if I told you then that all of these devices would soon be consolidated into a single, small, battery-operated device, you would have thought I was talking about science fiction. 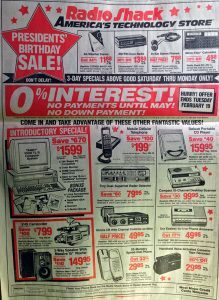 That was the case in a 1991 Radio Shack ad that listed 15 items for sale ALL of which are now available on your smartphone. Not including the many other items available on your smartphone today such as an entire music store, credit cards, keys to unlock certain doors or start your car, a measuring tape and a notebook to name a few. Although these advancements happened over approximately 20 years after the release of the ad, back then, it was in fact, a Hyperconvergence of everyday items we used. That same transition is happening today in data centers and government IT solutions, except the Radio Shack Ad would have listed your SAN, Hyperadvisors, load balancers, servers, and storage, among others. With a Hyperconverged environment, data centers are now able to consolidate the vast number of interfaces, management tools, hardware, networking and other technologies into a single “converged” environment. How does that benefit the government? First off, it drastically lowers costs — both in lighter hardware and software procurements and in a more efficient IT group. Support is simplified as there are less moving parts and less finger pointing. Your data becomes easier to protect with increased cybersecurity capabilities, and the entire data center becomes faster, lighter, and cheaper. Companies that offer government IT solutions such as Nutanix, Rubrik, VMWare, and AWS are leading the path to a Hyperconverged Infrastructure. Cloudsoft is focused on Hyperconvergence, data security, and modernizing your data center.